Living In LoCo: Volksmarch in Leesburg? Have I told you I love being a Girl Scout Leader? It's true. Implied in the word "Leader" is a thought that I might be leading or teaching my girls.... but I think it's really the other way around. I learn so much; and as a troop we're introduced to experiences that I would never have on my own. It's really very rewarding. 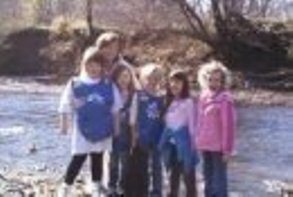 Recently, my troop participated in the "Volksmarch Girl Scout Walk Together". Volksmarch is a German custom, and means "People's March". Volksmarch events are organized, non competitive walking events. I have a friend (and fellow GS Leader) who used to live in Germany and she has many metals from participating in them. The tradition has been re-created here in America and the American Volkssport Association organizes walking events and walking clubs all over the country. Their goal is to promote "Fun, Fitness, and Friendship". Locally, the AVA organizes (among other things) "Walk Together" events for Girl Scouts; and the girls can participate individually or with their troop....and this year, my Daisies participated. It was GREAT fun. In addition to learning about the German heritage of this tradition, and about the organization, the event was held at a park rather close to my home that I had never explored... and I can't believe it. It's only MORE than 700 acres! I am ashamed to call myself a "local" and not to have even known where Banchee Reeks Park was! Well, I do now. And, I must say, it's glorious! The November day of our event was particularly beautiful, and we were blessed with a sunny, 70 degree day. Sadly, I left my camera in the car during the walk, so we have only one picture to share with you from the walk - and it was taken from a camera phone. I tried to get a few photos from our picnic site near the starting point of the trails, but these photos simply don't do the place justice. It's a place you need to explore - several times - before you even get a true lay of the land. I know my family and I will be back to further investigate the offerings of this park and the other trails. It was an awesome experience. It was so awesome in fact, that I hope at some point my schedule with the kiddos will be less crazy and perhaps I can join in on some of the other walking events with the AVA or the Loudoun Walking Club. Walking allows you to see even your every day surroundings differently... it's a different perspective. In my opinion, walking clubs are about committing yourself to "take time to smell the roses". Being a Girl Scout Leader is about committing yourself to help a Daisy bloom, and become all she truly can be. For now, I am content watching blossoming Daisies... but a point will come in my life when I have not only the desire, but the time, to smell the roses. Learn more about life here in Loudoun County by exploring this blog and by stopping back by to read about new experiences. If you have ideas on things you'd like to see in the blog, please contact me privately, I do want to be your resource for all things Loudoun!